Combine foam weapons, outrageous costumes, fake blood and real fighting and you get the Foam Weapon League, a real life Fight Club where you don’t get hurt as bad. The Foam Weapon League is the brainchild of David Ballard and Los Angeles actress Michelle Morrow, who is an avid fan of video games like World of Warcraft. The two also love epic films like Lord of the Rings or Star Wars so they came up with a concept that allows people to unleash their fantasy super selves in at organized events, without seriously injuring anyone. Michelle describes the idea as “a video game 1v1 duel – like in Mortal Kombat or Tekken”. It all began last October, with a secret event that took place on a rooftop. 12 outlandishly dressed warriors did battle that night, and after LA Weekly did a photo report on it, Ballard and Morrow started getting emails from producers, press, fans and the Foam Weapons League was born. Unlike in LARP (Live Action Role-Playing) fighters, the warriors of the Foam Weapons League come from any genre of fantasy, they don’t have any limitations. For example, one guy calls himself The Big Bad Wold and fights in a fur costume complete with a wolf mask, while one of the female fighters is known as The Butch Lesbian Avenger. Basically anyone with a cool enough costume and foam weapons can join the Foam Weapons League, as long as they follow the rules of engagement. The first thing FWL warriors have to understand is that it involves real fighting, and even though foam weapons aren’t lethal, they can cause bruises and welts. Nothing is choreographed so they must actually hurt and be prepared to accept the fact that they may get hurt. A fighting even is basically a tournament between two Foam Weapon League teams. Warriors from each team go head to head in battles consisting of up to three one-minute rounds. Each of the two opponents have fake blood bags attached to their “vital points” and the main goal is to break at least two of the other guy’s bags. There are two referees in the ring who watch four fouls like head-shots or bull-rushing. Every time a warrior fouls, 1 point is awarded to their opponent. If a warrior breaks one of his opponent’s bags he is awarded 3 points, but no matter how many points the two have, the one who manages to break two blood bags first, wins the match.If neither of the warriors manages to break two bags before the end of the three rounds, the winner is judged by number of points. In case of a tie, the two fight in a Sudden Death round, and the first to break a blood bag wins. Although the official site of the Foam Weapons League doesn’t provide too much information, it has become quite a phenomenon in LA, and its officials are currently traveling the country recruiting warriors for Major and Minor leagues. 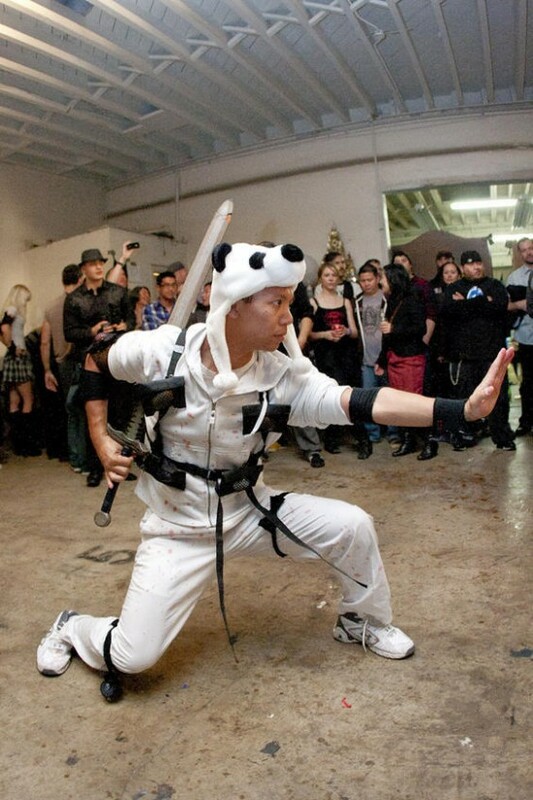 The plan for 2011 is to organize foam weapon battles in at least 12 US cities.